The MQTT Client Component sets up the MQTT connection to your broker and is currently required for ESPHome to work. In most cases, you will just be able to copy over the MQTT section of your Home Assistant configuration. When enabling MQTT and you do not use the “native API” for Home Assistant, you must remove the api: line from your ESPHome configuration, otherwise the ESP will reboot every 5 minutes because no client connected to the native API. broker (Required, string): The host of your MQTT broker. port (Optional, int): The port to connect to. Defaults to 1883.
username (Optional, string): The username to use for authentication. Empty (the default) means no authentication. password (Optional, string): The password to use for authentication. Empty (the default) means no authentication. client_id (Optional, string): The client id to use for opening connections. See Defaults for more information. discovery (Optional, boolean): If Home Assistant automatic discovery should be enabled. Defaults to True. discovery_retain (Optional, boolean): Whether to retain MQTT discovery messages so that entities are added automatically on Home Assistant restart. Defaults to True. discovery_prefix (Optional, string): The prefix to use for Home Assistant’s MQTT discovery. Should not contain trailing slash. Defaults to homeassistant. topic_prefix (Optional, string): The prefix used for all MQTT messages. Should not contain trailing slash. Defaults to <APP_NAME>. log_topic (Optional, MQTTMessage) The topic to send MQTT log messages to. birth_message (Optional, MQTTMessage): The message to send when a connection to the broker is established. See Last Will And Birth Messages for more information. will_message (Optional, MQTTMessage): The message to send when the MQTT connection is dropped. See Last Will And Birth Messages for more information. shutdown_message (Optional, MQTTMessage): The message to send when the node shuts down and the connection is closed cleanly. See Last Will And Birth Messages for more information. ssl_fingerprints (Optional, list): Only on ESP8266. A list of SHA1 hashes used for verifying SSL connections. See SSL Fingerprints for more information. reboot_timeout (Optional, time): The amount of time to wait before rebooting when no MQTT connection exists. Can be disabled by setting this to 0s. Defaults to 5min. keepalive (Optional, Time): The time to keep the MQTT socket alive, decreasing this can help with overall stability due to more WiFi traffic with more pings. Defaults to 15 seconds. on_message (Optional, Automation): An action to be performed when a message on a specific MQTT topic is received. See on_message Trigger. on_json_message (Optional, Automation): An action to be performed when a JSON message on a specific MQTT topic is received. See on_json_message Trigger. With the MQTT Message schema you can tell ESPHome how a specific MQTT message should be sent. It is used in several places like last will and birth messages or MQTT log options. topic (Required, string): The MQTT topic to publish the message. payload (Required, string): The message content. Will be filled by the actual payload with some options, like log_topic. qos (Optional, int): The Quality of Service level of the topic. Defaults to 0.
retain (Optional, boolean): If the published message should have a retain flag on or not. Defaults to True. level (Optional, string): The log level to use for MQTT logs. See Log Levels for options. 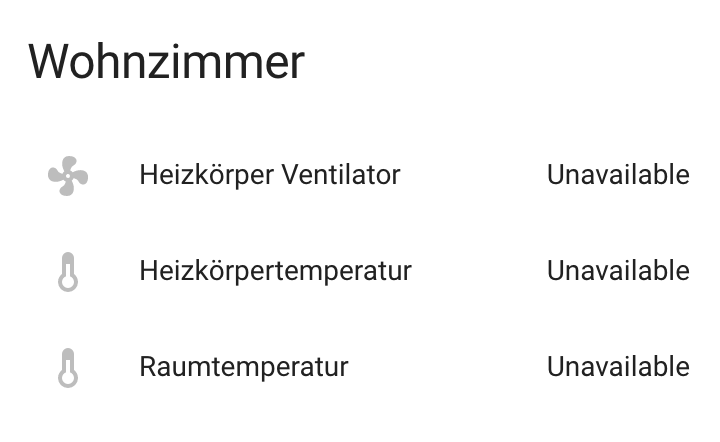 And that should already be it 🎉 All devices defined through ESPHome should show up automatically in the entities section of Home Assistant. When adding new entities, you might run into trouble with old entities still appearing in Home Assistant’s front-end. This is because in order to have Home Assistant “discover” your devices on restart, all discovery MQTT messages need to be retained. Therefore the old entities will also re-appear on every Home Assistant restart even though they’re in ESPHome anymore. This will remove all retained messages with the topic <DISCOVERY_PREFIX>/+/NODE_NAME/#. If you want to purge on another topic, simply add --topic <your_topic> to the command. By default, ESPHome will prefix all messages with your node name or topic_prefix if you have specified it manually. The client id will automatically be generated by using your node name and adding the MAC address of your device to it. Next, discovery is enabled by default with Home Assistant’s default prefix homeassistant. If you want to prefix all MQTT messages with a different prefix, like home/living_room, you can specify a custom topic_prefix in the configuration. That way, you can use your existing wildcards like home/+/# together with ESPHome. All other features of ESPHome (like availability) should still work correctly. ESPHome uses the last will testament and birth message feature of MQTT to achieve availability reporting for Home Assistant. If the node is not connected to MQTT, Home Assistant will show all its entities as unavailable (a feature 😉). By default, ESPHome will send a retained MQTT message to <TOPIC_PREFIX>/status with payload online, and will tell the broker to send a message <TOPIC_PREFIX>/status with payload offline if the connection drops. You can change these messages by overriding the birth_message and will_message with the following options. If the birth message and last will message have empty topics or topics that are different from each other, availability reporting will be disabled. On the ESP8266 you have the option to use SSL connections for MQTT. This feature will get expanded to the ESP32 once the base library, AsyncTCP, supports it. Please note that the SSL feature only checks the SHA1 hash of the SSL certificate to verify the integrity of the connection, so every time the certificate changes, you’ll have to update the fingerprints variable. Additionally, SHA1 is known to be partially insecure and with some computing power the fingerprint can be faked. All components in ESPHome that do some sort of communication through MQTT can have some overrides for specific options. name (Required, string): The name to use for the MQTT Component. retain (Optional, boolean): If all MQTT state messages should be retained. Defaults to True. discovery (Optional, boolean): Manually enable/disable discovery for a component. Defaults to the global default. availability (Optional): Manually set what should be sent to Home Assistant for showing entity availability. Default derived from global birth/last will message. state_topic (Optional, string): The topic to publish state updates to. Defaults to <TOPIC_PREFIX>/<COMPONENT_TYPE>/<COMPONENT_NAME>/state. command_topic (Optional, string): The topic to subscribe to for commands from the remote. Defaults to <TOPIC_PREFIX>/<COMPONENT_TYPE>/<COMPONENT_NAME>/command. When changing these options and you’re using MQTT discovery, you will need to restart Home Assistant. This is because Home Assistant only discovers a device once in every Home Assistant start. With this configuration option you can write complex automations whenever an MQTT message on a specific topic is received. To use the message content, use a lambda template, the message payload is available under the name x inside that lambda. topic (Required, string): The MQTT topic to subscribe to and listen for MQTT messages on. Every time a message with this exact topic is received, the automation will trigger. qos (Optional, integer): The MQTT Quality of Service to subscribe to the topic with. Defaults to 0.
payload (Optional, string): Optionally set a payload to match. Only if exactly the payload you specify with this option is received, the automation will be executed. With this configuration option you can write complex automations whenever a JSON-encoded MQTT message is received. To use the message content, use a lambda template, the decoded message payload is available under the name x inside that lambda. The x object is of type JsonObject by the ArduinoJson library, and you can use all of the methods of that library to access data. Basically, you can access elements by typing x["THE_KEY"] and save them into local variables. Please note that it’s a good idea to check if the key exists in the Json Object by calling containsKey first as the ESP will crash if an element that does not exist is accessed. Due to the way this trigger works internally it is incompatible with certain actions and will trigger a compile failure. For example with the delay action. Publish an MQTT message on a topic using this action in automations. topic (Required, string, templatable): The MQTT topic to publish the message. payload (Required, string, templatable): The message content. qos (Optional, int, templatable): The Quality of Service level of the topic. Defaults to 0.
retain (Optional, boolean, templatable): If the published message should have a retain flag on or not. Defaults to False. Publish a JSON-formatted MQTT message on a topic using this action in automations. The JSON message will be constructed using the ArduinoJson library. In the payload option you have access to a root object which will represents the base object of the JSON message. You can assign values to keys by using the root["KEY_NAME"] = VALUE; syntax as seen below. payload (Required, lambda): The message content. retain (Optional, boolean): If the published message should have a retain flag on or not. Defaults to False.